Talent is an amazing thing to behold up close. When it comes to professional athletes, when you see them in person their amazing physicality is intimidating. Television does not do them justice. Its the same with musical performers. On Saturday, we were invited to capture a private performance at a “backyard brunch” series being presented weekly this summer. Nicole Atkins is a performer of some renowned, as Neptune City her 2007 release on Columbia Records reached number 20 in the Billboard “heatseeker” chart. But from five feet away in a relaxed backyard setting, Nicole’s talent is breathtaking. 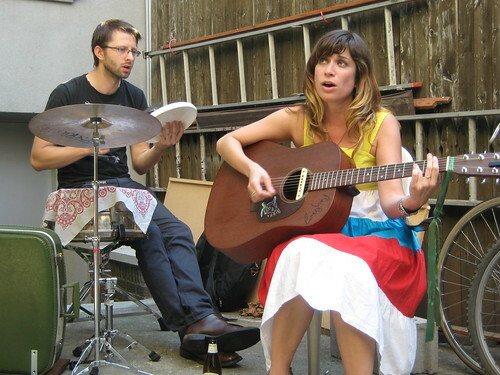 The Backyard Brunch series is unamplified, and yet even without the benefit of a sound system, her sweet yet powerful voice carried through all the ambient noise of a Saturday afternoon in Williamsburg to thoroughly entertain the intimate crowd. Nicole set included two songs from Neptune City and several songs that we anticipate will appear on her forthcoming album. Nicole Atkins performs again in NYC at the City Winery on August 7, when she returns from an extensive European tour. I recorded this set with four microphones placed within a few feet of the artist. Other than a few moments of wind and some outside noise, this is quite an exceptional capture. Enjoy! If you email nyctaper for access to this recording, we expect that you will PLEASE SUPPORT Nicole Atkins, visit her website, and purchase her official releases and other merch [HERE]. i was there for the performance. it was utterly breathtaking. (embarrassingly) it was the first time i had heard nicole’s music. i was blown away, and will surely catch her as she comes through the city again. everyone download this! it’s fantastic. thanks again for coming over to tape the show. it sounds AMAZING!!! i can’t wait to see what sort of mic rig you cook up for the next show. Thank you. This is the first live stuff of hers I’ve run across.